Apartments! The man made marvel that allows thousands of families to live one wall apart in harmony (sometimes not so harmoniously). The last few years saw potential tenants show more interest in apartments than in individual houses. Apartments have come a long way from their original concept. We see more and more apartments being part of immaculate complexes that have more than convenient living spaces to offer. They offer amenities, manicured gardens and some even have mini shopping complexes within them. Now, who wouldn’t want that? How to create a rental agreement for a flat? Renting an apartment has pretty much the same formalities as renting an individual house. But the contract is where all the difference lies. As you may know, a rental agreement or lease is a contracted between the landlord and the tenant through which a landlord grants tenancy to the latter. Flat rental deeds are not used in the case of individual houses. They are used when someone wishes to rent out a single unit in an apartment complex. Such rental agreements have to be drafted with care, with clauses for access rights to common amenities and the rules of the residents association. Ideally, draft the agreement a few weeks before you move in. That would give both the landlord and the tenant to make changes should they feel so. Any person who wishes to take part in a rental transaction can use a rental agreement to lay down the rules and duties. As long as you are 18+ years old and of sane mind, you can be either tenant, landlord or witness in a contract. Lessor: Often the landlord or the individual who is granting tenancy. Lessee: The tenant or the person who receives tenancy. Although rental agreements may be available online, they may not always be expert verified or comprehensive enough to cover all your needs. 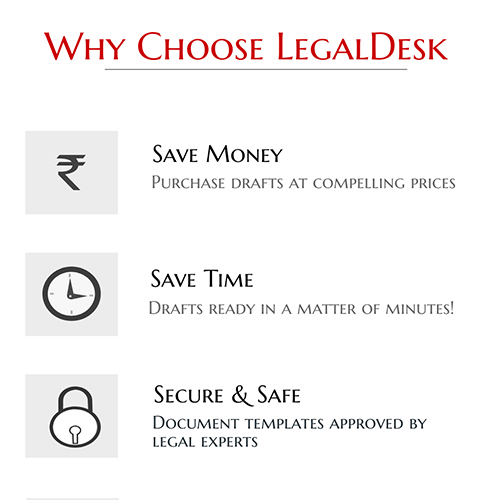 Hence, we strongly recommend that you use LegalDesk.com or any other professionally prepared document to make your agreement. To make sure that there are no loopholes in your agreement that can leave you exposed, make sure that you DO NOT FORGET to include clauses that are mentioned below. If you miss even one of the above, there could be consequences that are unpleasant. Irrespective of whether you are a landlord or a tenant, a good rental agreement is vital to protect both of you should a dispute happen. We hope you are convinced about the need for a professionally verified rental agreement for a flat. Try to avoid reusing the same deed you prepared for your previous rental home. How to make it legally valid? Like every other contract, a flat rental agreement too must have some basic clauses in place and some important entities to make it legally valid. Names, signatures and addresses must be mentioned without errors. The deed must begin with the name and address of the tenant and landlord being stated. The address of the apartment that is being rented out too must be mentioned clearly, without mistakes. The signatures of the tenant, landlord and two witnesses must be placed clearly on the last page along with their full names. To make the document legally valid, it must be printed on stamp paper of recommended value. What are the consequences of having a badly prepared flat lease? The consequences are many. But the long and short of it is that both parties will end up frustrated. Eg. lets take the example of a group of women who took an apartment on rent. They forgot to place the right to entry clause that restricts the landlord, in their contract. If the landlord turns up at 2 am in your apartment, you cannot do anything about it. Likewise there are many such incidents which will cause discomfort or sometimes even monetary damages to both parties. Will I be able to access common amenities provided in the apartment? That will be decided by the contract. If the landlord has given you the rights you may be able to gain access to said amenities. You may have to pay membership charges on a regular basis either directly to the residents association or to the landlord. Create a rental agreement for flat now! LegalDesk.com offers excellent pre-drafted flat rental agreements which can be prepared in a matter of minutes. We also have the facility to print the deed on stamp paper and mail it to an address of your choice! All you have to do is enter your details and the details of the property being rented out. Once you receive the deed printed on stamp paper, place your signatures at designated places and you’re done!